“The project is the world’s largest greenfield phosphate project – the largest reserves. The purest concentrate, the safest jurisdiction – in a commodity that is needed. We need phosphate, I am sure that next week, next month, next year, we are going to want to eat,” those are the words of Arianne Phosphate CEO Brian Ostroff. The Canadian junior holds the enormous Lac à Paul phosphate project located in the Saguenay-Lac-Saint-Jean region of Quebec. The project, which contains an enormous phosphate deposit, is blessed with existing infrastructure, a deep-water access port nearby and a localised skilled labour force, however its keenest attribute is the strategically critical nature of a phosphate deposit located in North America considering today’s global phosphate market environment. The constantly increasing global demand for phosphate is for its use as one of the three key components in fertilizer – the other two being nitrogen and potassium – and therefore a fundamental resource for a nation’s food supply. With 87% of the world’s phosphate used in the production of fertilizer, Ostroff says this makes it essential to global food security. “Close to 90% winds up in fertilizer however, there is a growing market for specialty applications, particularly preservatives and you will find phosphate in deli meats and Coca Cola for example,” explains Ostroff. From a global perspective North America, South America, western Europe and most of Asia all run a deficit when it comes to phosphate with the majority of this deficit supplied by huge levels of production in the Middle East and North Africa (MENA), predominantly Morocco. “Morocco is by far the world’s largest player in phosphate. It is probably close to four times bigger in the traded phosphate market than Saudi Arabia is in the oil market,” Ostroff notes. What it means is that the developed world relies on MENA countries to supply the first and key ingredient necessary to grow crops, feed animals and preserve food. Countries such as Tunisia and Syria used to be producers until recent uprisings and military conflicts severely diminished their output. Ostroff stresses how important it is for the global market to understand that the current deficit for phosphate is being supplied from an area where security of supply could be a concern. The demand for phosphate continues to increase annually as the global population grows and diets change. Ostroff puts the level of growth at roughly 2-3% p/a resulting in a required 4-6 million tonnes (mt) additional capacity each year. The industry has to ask itself how it can continually meet that increase. Another challenge is that the phosphate business is very vertically integrated and most phosphate rock production comes from mines owned by fertilizer companies. Recent figures show that around 85% of world phosphate rock production is owned by fertilizer companies and that can be a big issue for those who don’t have enough of their own supply. This is where Arianne’s Lac à Paul project comes to the fore, as it will be one of the largest independent phosphate mines in the world. In terms of its location, Quebec is a very pro-mining jurisdiction. Not only is there strong existing infrastructure, a highly skilled local labour force that is familiar with mining and, an extremely stable political and economic environment, but also, major North American fertilizer companies such as Agrium, PotashCorp and Mosaic all currently import phosphate rock. There is a strong argument to be made that if the required phosphate rock can be purchased in Canada as opposed to Middle East regions fraught with political tensions, then why wouldn’t the majors got for it – that’s assuming it is the same grade or better. Arianne’s Lac à Paul can produce some of the highest grade phosphate available on earth thanks to its nature as an igneous rock deposit. The vast majority of the world’s phosphate is contained in what is known as sedimentary deposits which are lower purity, less efficient to recover and generally contain harmful deleterious elements such as uranium, cadmium and thorium. Arianne’s igneous project is not saddled with the above issues. Igneous deposits are rare, currently there are only roughly a dozen igneous rock deposits worldwide or under 10% of world production. “Igneous deposits do not have the deleterious elements. That allows you to make much purer phosphate concentrate which can be used for more and more specialty applications,” Ostroff says. Consumers are becoming more aware of the contaminants in phosphate too, with the EU in the process of drafting legislation to limit the amount of cadmium in imported phosphate and recent environmental issues in the United States. As mentioned the grade of concentrate from igneous deposits is far superior to that of sedimentary and that is the case for Lac à Paul. The project can produce a 40% purity for its phosphate concentrate which means it will not be competing in the same market as average sedimentary MENA production of 29%, or at least not for the same price. So before expanding on the details of the project, to recap phosphate is a strategically critical commodity, there is a demand side deficit in key markets which will continue and grow, Lac à Paul is located in a favourable jurisdiction for mining, there is existing heavy infrastructure and access to qualified labour locally. Having been progressing for six years, it is easy to understand why the project was granted its mining licence at the end of 2015 when you consider the size of the resource and the potential economic benefits it will bring to the region. 702mt in the Paul zone and including the inferred resource there are over 1 billion tonnes so far in the ground. A study of the project economics quickly begins to highlight how robust it is. The 2013 feasibility study set the net present value at $1.9 billion with a capital expenditure of $1.2 billion. Arianne’s figures suggest gross margins of roughly $100/t so, at 3mtpa, profit is predicted at $300 million p/a with just a four-year payback on capital. In terms of the exponential benefits the mine performs equally well. Tipped as the biggest development in Quebec the riches for the region are very substantial. “According to an independent study, Lac à Paul should provide about $12.5 billion of economic benefit to the region in the first 25 years. It should bring the employment of over 2,000 people during construction and thereafter 1,000 direct and indirect jobs – bringing about $1 billion in employment income to the region. While 2015 and 2016 were critical years on the operational side in terms of securing the permit, Arianne is now pushing on to tie up the financing for the project which will lead to the construction phase. Arianne is working with UK-based Endeavour Financial, a highly regarded project-finance natural resource advisory company, to bring the project forward to financial close. Ostroff wants to demonstrate to financial institutions how financeable the project really is. Ostroff is also in talks with both fertilizer companies and off-take trading companies in order to secure contracts at the point of production. Once financing is secured the construction phase is expected to take two years. 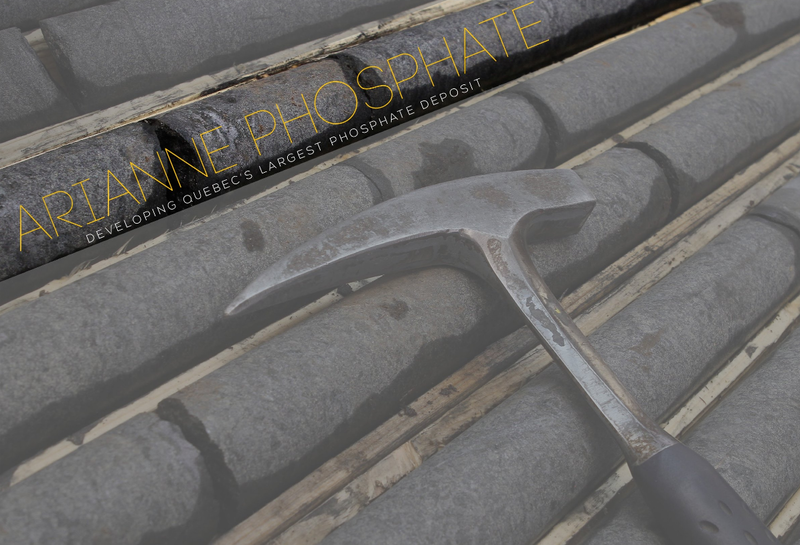 With the strategic nature of the resource, the strength of the existing infrastructure and financing in place, Arianne will be primed to develop one of, if not the most, significant phosphate rock projects on world terms this side of the millennium.